The immensely influential work of Jacques Lacan challenges readers both for the difficulty of its style and for the wide range of intellectual references that frame its innovations. Lacan's work is challenging too, for the way it recentres psychoanalysis on one of the most controversial points of Freud's theory - the concept of a self-destructive drive or `death instinct'. Originally published in 1991, Death and Desire presents in Lacanian terms a new integration of psychoanalytic theory in which the battery of key Freudian concepts - from the dynamics of the Oedipus complex to the topography of ego, id, and superego - are seen to intersect in Freud's most far-reaching and speculative formulation of a drive toward death. 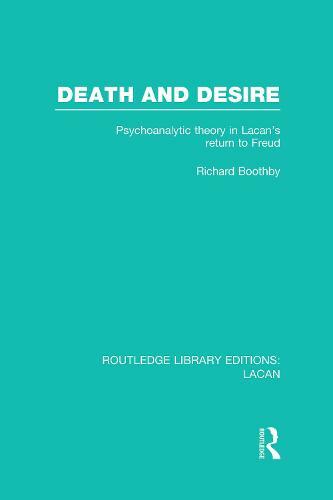 Boothby argues that Lacan repositioned the theme of death in psychoanalysis in relation to Freud's main concern - the nature and fate of desire. In doing so, Lacan rediscovered Freud's essential insights in a manner so nuanced and penetrating that prevailing assessments of the death instinct may well have to be re-examined. Although the death instinct is usually regarded as the most obscure concept in Freud's metapsychology, and Lacan to be the most perplexing psychoanalytic theorist, Richard Boothby's straightforward style makes both accessible. He illustrates the coherence of Lacanian thought and shows how Lacan's work comprises a `return to Freud' along new and different angles of approach. Written with an eye to the conceptual structure of psychoanalytic theory, Death and Desire will appeal to psychoanalysts and philosophers alike.